Light Gives Heat is a non-profit organization with a vision to rebuild and renew Africa from the inside out, as well as see people in the West live with hope. Dave and Morgan Hansow quit their jobs, rented out their home, and boarded a plane bound with hope themselves, as they flew across the world to Uganda to adopt their child. In the midst of finding her, Light Gives Heat was created. Five years later, they are empowering Africans, and giving women the means to work with a steady income, to be able to provide for their families. 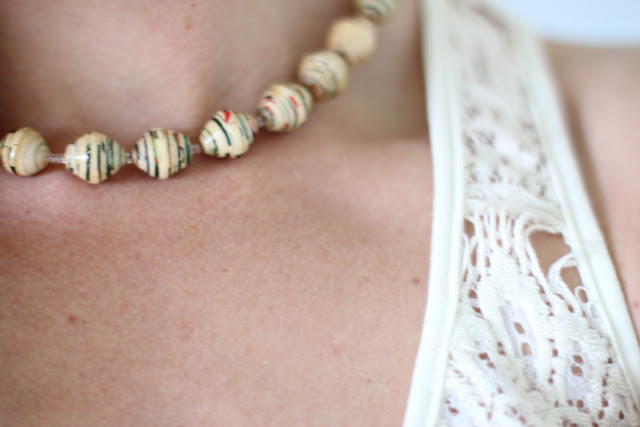 These talented women create products made from up-cycled paper beads. Mokoda Hellen created the necklace I am wearing here. She is 35 and has 4 children. You can read more about Light Gives Heat here, about the women behind the products here, and help support the cause by visiting Light Gives Heat's shops here. I thought those looked like paper beads! Very pretty. It's always the best when you can be fashionable AND help support those in need at the same time. what a great cause....I would love to go to Africa. There is a song by Jars of Clay called "Light Gives Heat" which is a beautiful song.. I wonder if they are related in any way? Beautiful cause and beautiful necklace! Love this look and love the cause! 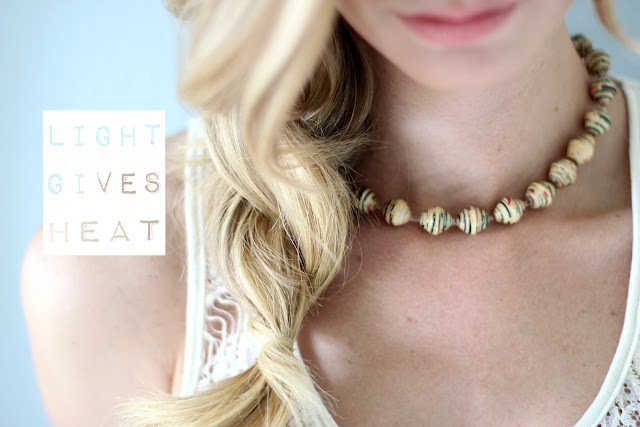 You should also check out 31 Bits at http://31bits.com/ They also sell paper beads for a great cause! Thank you for mentioning Light Gives Heat in your blog and we are grateful that you have supported us in the past. Currently we are in a contest to win $50K with Cultivate Wines. All we need are votes. Voting goes until June 30th and votes can be casted daily. If you can please share this link in your blog www.voteLGH.com this would help us out a ton.